American Society of Clinical Oncology and Susan G. Komen for the Cure Clinical Award/Grant. Medical Director, Woman to Woman Program, grant funded by the Ovarian Cancer Research Foundation. American Society of Clinical Oncology Merit Award. Organon Research Award for Resident Research Excellence. 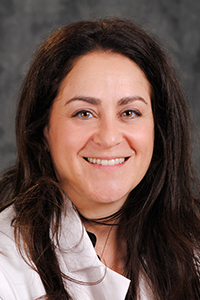 Dr. Sharyn N. Lewin, a board-certified gynecologic oncologist, is the Medical Director of the Division of Gynecologic Oncology at Holy Name Medical Center and specializes in the diagnosis, treatment and management of ovarian, endometrial, uterine, cervical, vulvar and vaginal cancers. Her practice employs a comprehensive, multidisciplinary team approach to screening, treatment and overall improvement in quality of care for women at high risk for ovarian cancer and other gynecologic malignancies. To ensure all patients with ovarian cancer have the best possible outcome, Dr. Lewin performs radical operations-examining the upper abdomen and extended pelvic area-to remove all visible signs of cancer, an effort not offered by many gynecologic oncologists. She also has expertise in minimally invasive laparoscopic procedures and robotic techniques. Dr. Lewin is a strong proponent of intraperitoneal (through the abdomen) chemotherapy and has research interests in novel chemotherapeutic agents, including immunotherapy and hyperthermic chemotherapy for recurrent ovarian cancer.